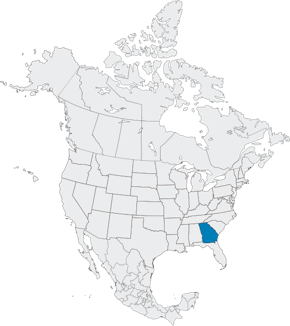 State of Georgia - FTS Inc.
U.S. state located in the southeastern United States, bordering Florida to the south and the Atlantic Ocean to the east. The terrain in the state of Georgia is diverse, with the tail end of the vast Appalachian mountain range in the northern region of the state. Moving south, the foothills give way to vast plateaus and coastal plains rolling into the southern border and ending at the Atlantic coast in the southeast. Much of the land is forested with deciduous and broadleaf trees, with 250 native tree species and 58 protected plants. The climate is humid subtropical, with occasional temperature extremes in both the winter and summer months. The entire state experiences medium-heavy precipitation year-round, and hurricanes often batter the coast in the summer months. The State of Georgia has been an FTS customer since 1991. 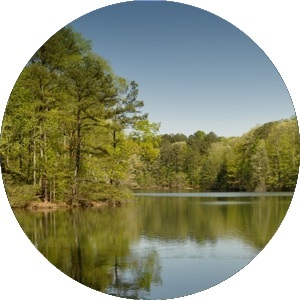 The state of Georgia is home to many native tree and plant species, and the fire RAWS stations play an important part in protecting these valuable environmental resources.